We’ve heard about placebos. You know, the sugar pill researchers give a subject and suddenly their migraine is better. No wonder I still have the same migraine for three days. But is it real? Harvard says placebos can be as effective as traditional treatments for some things, but getting the placebo effect requires more than just positive thinking. Basically, placebos are effective by creating a stronger link between the brain and the rest of the body. They don’t actually cure disease. So, cancer cells or brain tumors aren’t going to be shrunk by the placebo effect. However, placebos can make you feel better. Where they excel is in areas regulated by the brain. Things like pain, fatigue, and stress. We still don’t completely understand how placebos work. Imaging and blood tests have shown us that there are real changes in the areas of the brain that light up and in the neurotransmitters present in the brain. We also don’t know why placebos are more effective for some people than others. We do know that the process of being treated plays a part. Going to a doctor, being examined by perceived professionals, being given pills or asked to undergo procedures all has an impact. Perhaps it’s because you feel like you’re getting care, or perhaps it’s because the brain is now focused on a problem. Again, we’re not sure. 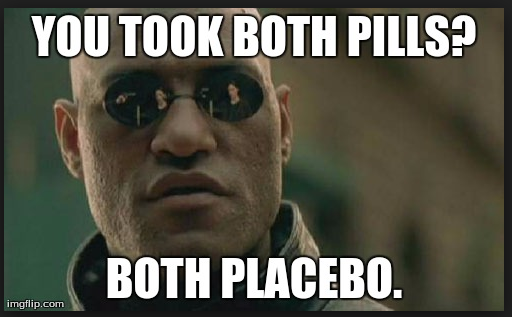 Being the skeptic that I am, my next question was can I get a placebo effect for taking sugar pills I know are sugar pills rather than my expensive migraine meds. I make the same face all the time. 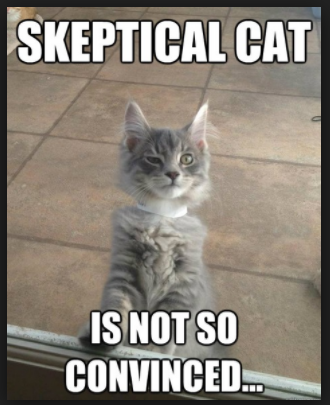 Hazard of being a skeptic. The answer is a definitive maybe. In a 2014 study published in Science Translational Medicine, one group took a migraine drug labeled with the drug’s name, another took a placebo labeled “placebo,” and a third group took nothing. In the study, the placebo was 50% as effective as the real drug to reduce migraine pain. Researchers can’t say why this was the case, but they suspect it was the act of taking a pill. The participants’ brain sees taking the pill as medicine, so it creates a healing effect. Remember, pain is something the brain controls. I doubt this will work for me, as even taking Excedrin Migraine medicine isn’t enough to kill my migraines. Still, it might work for others. How about you? Ever experienced the placebo effect? Did it work for you? Our organism is able to heal itself in certain cases. The best would be to extent this capability to other cases as well. Placebos can trigger this process somehow. Without medication I was having 2 migraines a week and daily headaches. I know what works & what doesn’t – the daith piercing. Although initial Botox trials helped but then stopped, perhaps that was placebo. I need to look more into this daith piercing. You’re the third person I’ve heard mention it. Did you have it done by a doctor? How did you learn about it? A friend booked me it at my local tattoo pallor, they do body piercing there. Compared to a migraine the pain is tolerable & over with in a few minutes. Most people swear by them. It’s worth a try.